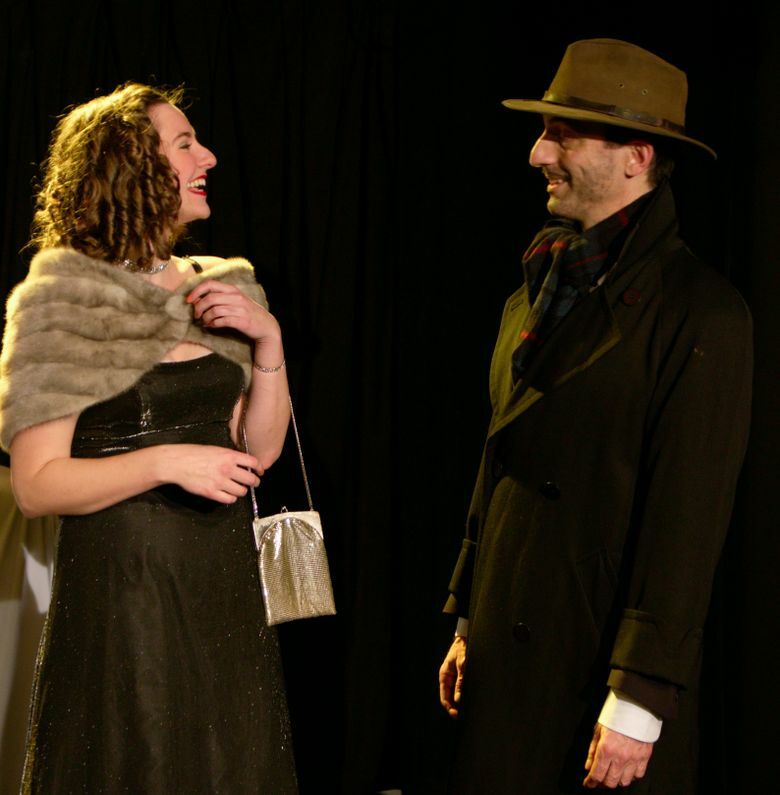 A review of “My Man Godfrey” at Theater Schmeater, a new stage production of the 1936 film about a homeless man — with a secret background — who becomes a wealthy family’s butler. In 1936, an American socialist named Morrie Ryskind co-wrote the screenplay for “My Man Godfrey,” a film about a homeless man living in a New York City dump who is propositioned by two socialite sisters who need a “forgotten man” for their evening’s scavenger hunt. Their request is a ludicrously tone-deaf insult. But Godfrey, a man of genteel poverty (who has a secret, high-society background of his own), accepts. He eventually becomes the family butler and teaches the household a few lessons about manners — beyond mere etiquette. Eventually, Ryskind left the left. (In 1947, he testified as a “friendly witness” before the House Un-American Activities Committee.) But “My Man Godfrey,” a riches-to-rags-to-riches story — originally a short novel by New Yorker writer Eric Hatch — stuck around. Through Feb. 18 at Theater Schmeater, 2125 Third Ave., Seattle; $24-$27 (800-838-3006 or schmeater.org). In the current stage revival by Theater Schmeater, Eric Smiley plays Godfrey with the necessarily subtle, ironic humility. “I’m the forgotten man,” he explains when he brings a morning hangover tonic (tomato juice, with plenty of Tabasco and Worcestershire sauce) for the sisters’ batty materfamilias, Angelica (Teri Lazzara). Most of the performances in “Godfrey” are either desultory or too broad — sometimes, the goofiness of the high-society caricatures and their over-accentuated accents erode the gut-punch of the story — but Smiley and Lazzara are a delight. While Smiley plays Godfrey with knowing grace, Lazzara nails her caricature of Angelica as a charmingly oblivious flibbertigibbet who can land four facial expressions in a matter of seconds. Her visage has the dexterity of an Olympic gymnast. In one early scene, a man at the Waldorf-Ritz hotel stumbles and smacks into her rear end. Lazzara’s face promptly careens from surprise to indignation to titillation to grinning at the audience with exhibitionist glee. Most stories about highfalutin’ life in the 1930s require a wisecracking maid, and Alysha Curry as Molly has an admirable, eye-rolling world-weariness. We should all be so sanguine when dealing with the fickleness of the world — and capricious employers. Theater Schmeater director Doug Staley said he chose the play after his daughter had suggested it as a wacky comedy (“everyone needs a laugh after the holidays — all the charge-card bills hit,” he said) that wasn’t totally vapid and addressed some of the same income-inequality tensions we’re all facing today.